Dealer always hits on a Soft 17 in Spanish Blackjack. 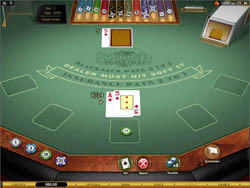 Splitting is allowed, and you can re-split a maximum of 3 times, giving you up to 4 hands to play. Aces can be re-split. Split aces receive one more card, and then you must stand. Ten-point cards dealt on split tces give you 21, not blackjack. Doubling down is also allowed, at a cost equal to your original bet. You can double dDown on any hand, even after you have hit or split. The only time you cannot double down in Spanish Blackjack is if you are dealt blackjack. Insurance is available at 1x your original bet, and you can durrender, losing half your bet, to not play a hand. If you’ve ever played a game by Microgaming before, you know that you can expect quality graphics and gameplay. The layout of Spanish Blackjack is just perfect. The dDeal button, for example, turns into the hit button once you have your cards, and the stand button is right next door (In Spanish Blackjack Gold version, the main buttons only show up on the screen when you need them, so nothing gets in the way of your view of the table). This means once you have set your bet, you barely have to move your mouse to keep playing. This is the kind of forethought and excellent design you will find throughout the game. Plus, the graphics are just right too – nice, realistic, and bold, but not flashy or overdone. Remember to approach a game of Spanish Blackjack differently than you would a regular 8 deck game of blackjack. The 10’s are missing, after all, so don’t let your count get messed up! Also, don’t surrender if you get a couple of 2’s! The extra payouts mean that you can still win with low cards, as long as they end up adding to 21. Keep htting and see where it takes you. If you like to play different blackjack variations, then you definitely have to try Spanish Blackjack. Actually, try it anyway, even if you tend not to play variations, because this is a great game. The extra payouts add a lot of excitement, especially when you land a good hand and win big! Just look up a good strategy for this game, or use the built-in Autoplay strategy table, and start playing now!